LESS THAN FIFTH of people in Ireland trust Fianna Fáil to manage the economy again, according to a new poll. 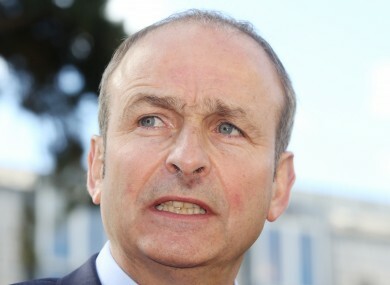 The latest Claire Byrne Live/Amárach Research poll has found that Micheál Martin’s party has an uphill battle to convince voters it should be returned to government at the next election. The poll of over 1,000 people found that 63% answered No when asked: Would you trust Fianna Fáil to manage the economy again? Less than a fifth, 19%, answered Yes while 18% said they didn’t know. Nearly 70% of people aged 55 and over said they would not trust Fianna Fáil to manage the economy again. Younger people were not as strong in that belief with 54% of people between the age of 15 to 24 saying they would not trust the party on the economy. In Dublin, where Fianna Fáil has no TDs, 66% said they would not trust the party with the economy again while this was 55% in all other parts of Leinster outside the capital. Since its historic general election capitulation in 2011, where it garnered just over 17% of the vote and lost over 50 Dáil seats, Fianna Fáil has struggled to rise beyond the low 20s in the opinion polls. An Ipsos MRBI poll for the Irish Times last month placed the party on 20% support. Despite this, Fianna Fáil is currently the largest party in local government. However, Martin has ruled out going into any coalition government with either Fine Gael or Sinn Féin after the next election making a return to government less likely on current polls. Email “An awful lot of people don't trust Fianna Fáil to manage the economy again”. Feedback on “An awful lot of people don't trust Fianna Fáil to manage the economy again”.